Each October, Harvest Days at the Garfield Farm and Inn Museum provide children and adults alike with the opportunity to learn about the realities of our rural heritage. On Friday, school groups are invited to the museum while individuals and families attend on the following Sunday. The Harvest Days for school groups is limited to 600 students with advance reservations required. 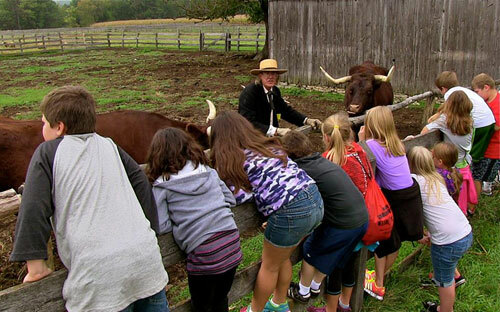 The public is invited the following Sunday to experience 19th Century life at Garfield Farm. The historic demonstrations remind us of the incredible amount of effort it took to survive in a non-mechanized world. Children can see firsthand how the grain that made the midwest so important was processed in the 19th century. Fall was the time to harvest the bounty of the orchard, and apples were a versatile and important crop. The flash of red and clatter of gears, the sweet fragrance that arises as the apples are crushed, and the golden brown cider flowing into the bucket capture the attention of young and old alike at the cider pressing demonstration. The demonstrations of 1840s household and farm skills at Harvest Days stimulate the minds of the young and the old. Their imaginations are catered to by the words and tall tales of Reid Miller, Teller of Tall Tales, whose traditional yarns and songs fit the historic setting of Garfield Farm. Tours of the 1846 brick inn will be ongoing. Tavern tours often spark conversations between grandparent and child as grandparents recall their childhood visits to family farms. Children will delight in seeing the museum’s farm animals. These include mostly rare heritage breeds of chickens, turkeys, sheep, hogs, and oxen. Tours of the museum’s prairie reconnect visitors to nature and its resilience, as the last prairie flowers bloom and go to seed. Donations for Harvest Days are $6 for adults and $3 for children under twelve.